Go south on I75 to SR 123, exit #36 (Franklin / Lebanon exit). This SR123 is two exits south of where I675 meets I75. At the bottom of the exit turn left (east) on SR 123 and go 1/2 mile to Beal Road. Turn left (north-east) on Beal Road. 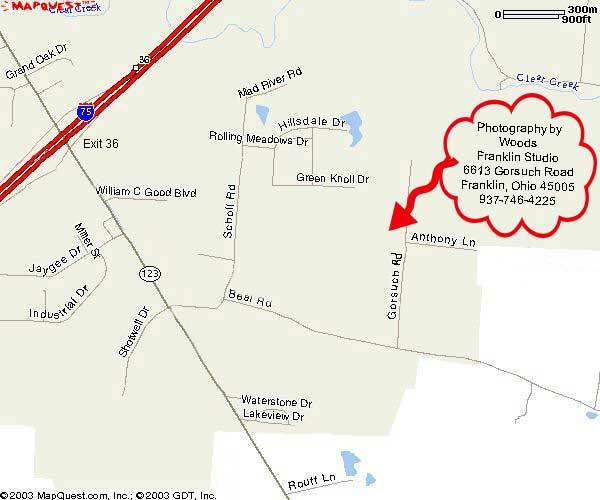 Go 1/2 mile on Beal Road and turn left on Gorsuch Road. Studio is 1/4 mile on left. Go north on I75 to SR 123, exit #36(Franklin / Lebanon exit). At the bottom of the exit turn right (east) on SR 123 and go 1/2 mile to Beal Road. Turn left (north-east)on Beal Road.